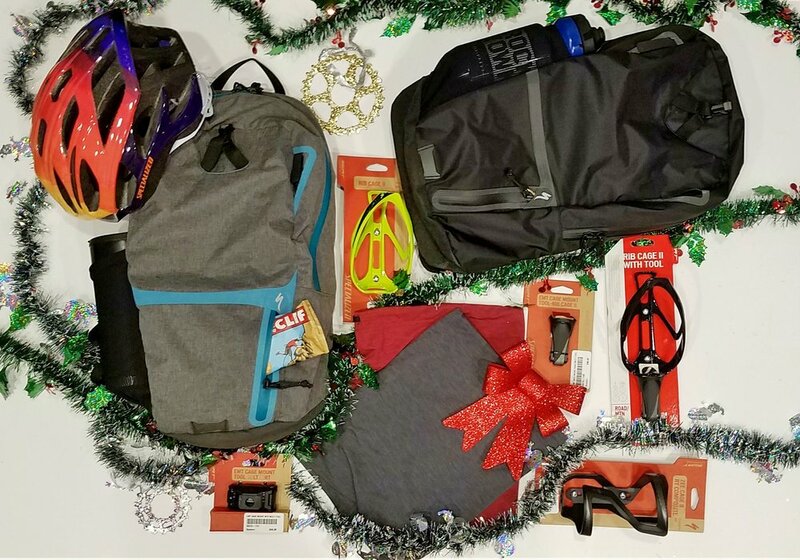 The Holidays are here, and with them come all sorts of cool items (and bikes) to give to the special cyclists in your life! 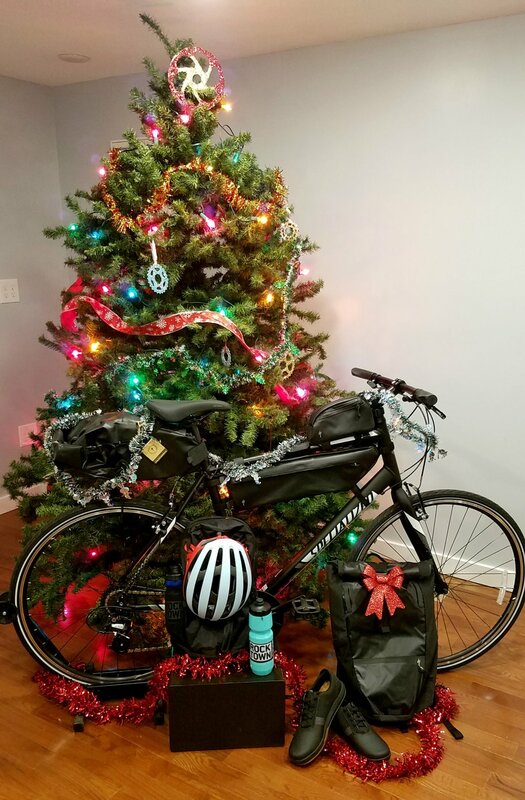 If you've ever found yourself struggling to figure out what a fun, usable gift would be for a cyclist (be it commuter, roadie, mountain biker, or bike enthusiast) have no fear! We have put together a Holiday Gift Guide to help your holiday season be loaded with fun! "The Big One" - someone's getting a new bike this year, aren't they? On-the-go - bike commuter life! Even though it is colder out now, this is the time of year many of the new products come trickling into the shop. It’s a great time for us because if there is something we haven’t had a chance to take a close look at, or we haven’t seen in person yet, we get to spend some time evaluating it. The evolution of LED technology is great for us. I ride with an LED taillight on all of my rides now, day or night. I’ve experienced more courtesy from drivers, and wider berth when they pass me. I attribute this simply to drivers being aware of my existence from farther away and a conscious/ subconscious ability to prepare for a pass. I personally ride with the Specialized Stix Comp. Simple, small, lightweight, clever in design, and with enough battery life to last me on my long rides. Specialized just redesigned these for their second generation with more lumens and better lenses to make those lumens go farther. Aside from the included mount for handlebar or seatpost, there is a full complement of mounts available for helmet, pant leg, belt, seatbag, rack, aero seatpost, or if you have a Specialized saddle, a bolt-on saddle mount (especially helpful for droppers). The light itself is a USB stick (Stix) and will plug directly in for a very quick charge to full. The other top contender are the Cycliq light/cameras. Kelly has been using her FLY 6 taillight for about 6 months now. It combines a bright, 6 hour life taillight with a camera that records on a 6 hour loop. You can export the video (complete with timestamp) after your ride, or just let it be and it will record over it. It has an intuitive beep system to notify the user of battery life upon turn on and shut off. This light offers great piece of mind for identifying aggressive drivers or just pulling some video to post of your friends on your last big ride! We also have the Cycliq FLY 12 headlight/camera! The headlight is a 400 lumen headlight combined with a 1080p camera. More lumens and recording time (higher quality video as well) than the taillight, and with plenty of mounting options. The Hotshot has been a great rechargeable LED taillight since LED lights have gained traction. These things are BRIGHT. With a seatpost or seatstay mounting bracket, the light can easily be clipped on and off for charging. Not as flexible as the Stix lights, but the Hotshot 100 packs more light at $40, and the Hotshot 50 comes in with half the lumens for $30. Both rechargeable with usb cord (included). On the headlight front, most of us use a light out of the Niterider Lumina series. These are compact, all one piece light/battery headlights with good mounting brackets (helmet or handlebar) we stock from 550 lumen to 900 lumen in this range. All of the lights have plenty of brightness settings to ration battery accordingly, and a red light low battery indicator that notifies the user well in advance. Walk mode is a really nice feature. At 30-50 lumens and ~18 hours of battery life I use the Lumina as a compact flashlight while camping or around the house all the time. With headlights durability, battery endurance (short and long term), and brightness is really important! I have been using the Lumina light series for years and have never had a failure. The estimated run times have always been spot on or more generous than listed, and battery degradation has been imperceptible. And I night ride a lot in the winter months. The other favorite here is the Cygolite Dash Pro. Definitely geared more towards the commuter vs. the Lumina. It has daytime running lamps in addition to the typical headlight for road surface visibility. Great for catching motorist attention around town. Both sets of lights can be controlled individually. I like to have data. Whether to share on Strava, see what the temperature was like on a similar ride from a previous year, or just how my heart rate was on a climb I’ve used a gps for almost 7 years now on my rides. My favorite these days is the Wahoo Bolt. Compact, great high contrast (no glare) screen and REAL BUTTONS. I am so done with touch screen units. This Bolt computer doesn’t lag, has all the features I use (including routes) and is really simple and intuitive to manipulate. With Wahoo’s phone app setup is easier than any other unit I’ve used and performance is awesome! I won’t be getting anything else anytime soon. This just came in a few days ago and I was immediately excited about it. I have very cold hands and feet in general, and in January/February really struggle, especially on long, nighttime rides. I have some of the Element 3.0 gloves with Gore Windstopper which are wonderful. I used them down to temps in the single digits, but at 9 degrees my fingers aren’t exactly warm after 30 minutes. Having previously tried Bar Mitts and not being impressed I am excited to get the Insulator Mitts on my bike. My first impression is that they feel like a nice sleeping bag for your hands! 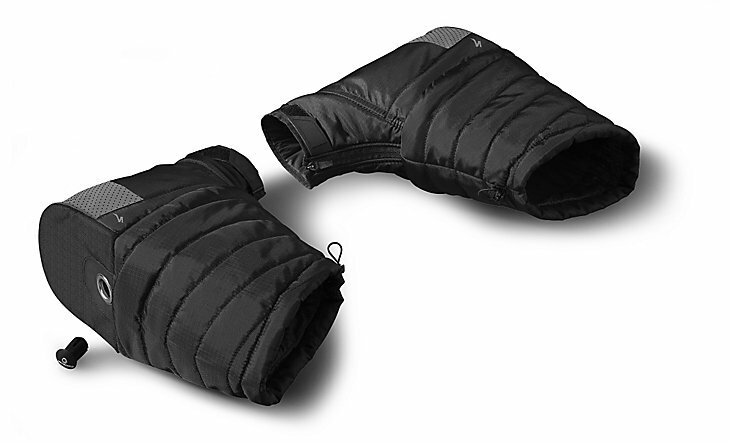 The Insulator Mitt has primaloft insulation, which is a lightweight, synthetic, high loft, insulation that retains much of its insulative properties wet. There is also a pocket on each mitt inside the mitt for chemical hand warmers if needed. It would be nice to ride with these on a 20 degree day with only liner gloves on! The ISSI line of pedals is a newer, colorful line of pedals we have really liked at the shop. Using the popular SPD cleat design, the ISSI line provides some cool options. The Flash series is the smaller platform, lighter weight side of things. Coming in at 342g per pair, they come in the economical Flash up to the Flash 3, the latter coming with 3 sealed cartridge bearings. That’s one more bearing than Shimano, and the Flash 3 comes in many, many colors, most of which we have here at the shop. The Trail pedals share the same bearing technology as the Flash series except with a larger platform. Coming in at around 412g per pair and also available in many colors in the Trail 3. All of the ISSI pedals have ample float and are compatible with other SPD cleats. Flash- 352g/pair 2 bushing, Black. Flash 2- 340g/pair 2 bearings, 1 bushing, All the colors! Flash 3- 342g/Pair 3 Bearings, All the colors! Trail 2- 402g/ Pair 2 Bearings, 1 bushing. Trail 3- 408g/ Pair 3 Bearings, All the colors! The Q Factor is roughly 4mm narrower on standard pedal vs. XTR, which will be good for most people. Almost all models available in a +6 and +12 spindle option (not available in colors). XTR pedal is 310g for comparison and has 2 bearings and slightly lower stack height. These pedals are rebuildable, XTR are not. These packs are new from Specialized for 2018. I received one of these while out at the Dealer Event this past September. Knowing that I would be coming home with and extra bag (and I do carry-on as much as possible for flights), I was excited to see how this bag would do with carrying things on my flights home. I ended up using this backpack for the whole dealer event and was extra stoked on how well it did with traveling home. It fits perfectly under the plane seats, even while holding my laptop, books/magazines, travel goodies, and having my helmet attached to the outside. It is very lightweight, and has just the right amount of large space and number of pockets. The reflective elements along the outside are REALLY reflective, and the Helmet clip/straps keep your helmet securely in place - no sliding around or flopping to one side. Besides all of the cool pocket spots, the other detail of this pack that I like a lot is the magnetic strap clip. You can pretty much get it clipped with one hand. Neck gators are one of my favorite cycling clothing accessories. I'm one of those people that gets a bit irritated if I'm over heating in any way. My core and hands stay pretty warm for the most part, but there are those days where you want just a little bit of extra insulation. That's where the neck gator comes in. It also functions as ear/partial face cover for those super crisp cold mornings or windier days. The Drirelease one from Specialized is especially nice for the winter months because it's a bit heavier weight and dries quickly (Drirelease technology). It also has a cinch cord to lock in warmth for when those temps drop (I've made mine into a hat for times off the bike, too). Never worry about losing your multi-tool or forgetting to bring one with you again! There are a variety of bottle cages and tools to mount on your bike - road and mountain bike specific. I'm pretty notorious for losing multi-tools, so when all this cool SWAT stuff (Storage, Water, Air, Tools) came out from Specialized, I got pretty excited. Enduro Pro Shorts $130 - The shorts are awesome because they include both baggies and bibs. The SWAT bib shorts have pockets on the back similar to jersey pockets so you can wear any shirt you want and still have your gear. POC VPD 2.0 Knee Pads $110 - I use these knee pads when riding the rocky local trails just in case of a fall. I haven't had any irritation from pedaling in them and they can help keep the cold out as winter approaches. POC makes the most comfortable protective equipment I have used. Genuine Innovations Tubeless Tackle Kit $19.99 - This is a new kit that carries tire plugs and valve cores in a little tube. The tool is in the cap and can be preloaded for a quick repair. There is a valve core tool built into the bottom of the tube. You can get the plugs and tool for $8.99 but this kit stores them nice and the valve core wrench can be super handy out in the woods. These items can cover a broad range of cycling necessities, from flat repair, to clothing, to nutrition, hydration, and so on... It is so much fun to get fun and creative with these gifts! Below are some of the staples for stocking stuffer gifts, but we have a lot more cool items in the shop, too! NEW BIKE DAY! 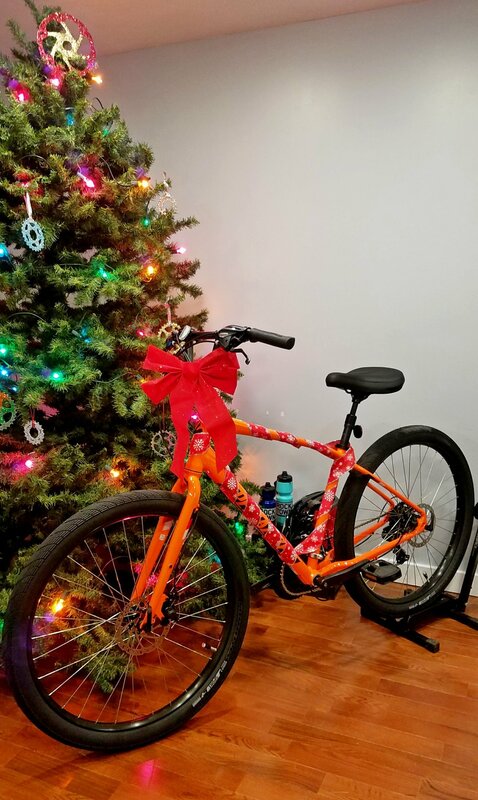 Make someone's dreams come true with a brand spanking new bike! The ROLL Sport (left picture) is A LOT of fun. Don't let the big tires fool you into thinking this is a "slow" bike. One ride on this thing will put a smile on your face. I like to think of the ROLL as a funcitonal beach cruiser style bike. It has gears, is not heavy, climbs very well, and is quite comfortable. The disc brakes offer peace of mind with their modulation and power, and are also low maintenance. The frame comes in a straight top tube design and a low entry design. We are big fans of both! The Stumpjumper Expert 29/6Fattie (right picture) will bring your trail riding to the next level! Trail Geometry Carbon frame, carbon wheels, SRAM 12speed Eagle drivetrain, Guide R brakes, Dropper Seat Post, FOX 34 Performance Fork, and RockShox RT3 Shock... What more could you ask for?! The Stumpjumper has been one of our favorite mountain bikes at Rocktown. The riding here is technical, with a lot of climbing and descending. The Stumpjumper can do it all! If you don't belive us, just ask Kelly. She raced the SM100 on one in 2016 and placed in the top 10 women (and had a blast on it the entire time)! It has also been rated the #1 Trail Bike of 2017 for Singletracks.com readers! *S-Card Financing is available with 0% Interest for 12 months! It's cold outside! But don't let that stop anyone from riding! We have a variety of Cold Weather Gear, and a handy Guide, to help you find the perfect piece of clothing. These are a few of the items you will see the Rocktown Staff & friends wearing on those chillier days. Do you commute, not use a car, bike pack, or go on all sorts of adventures by bike? These items will take your travel by bike life to the next level! These bags and gear are awesome!! The backpacks, Burra Burra bags, and shoes are all SUPER water resistant. We have had several customers use these bags with great success for bikepacking in places like the Allegheny Passage and Blue Ridge Parkway. 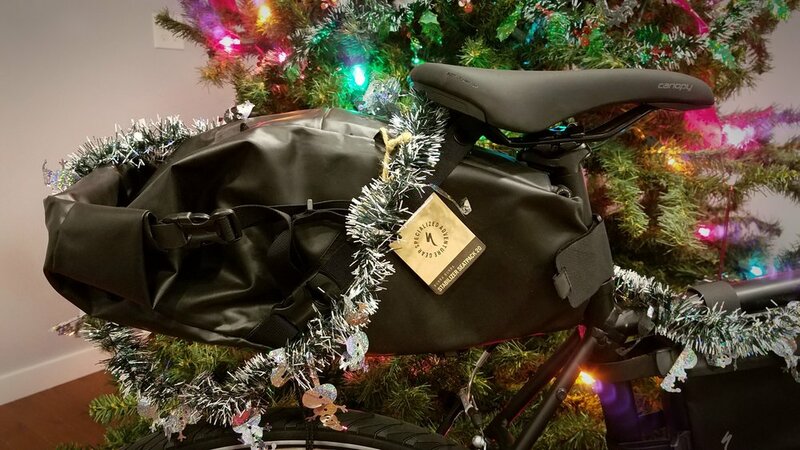 The Burra Burra Stabilizer Seat Bag and Frame Bag are offered in two and three different sizes (20L and 10L for the Seat Bag, and 8L, 5L, and 3L for the Frame Bag). I've never been more impressed with and adventure specific seat bag than the Burra Burra Stabilizer Seat Bag. It has three different places of attachment, so there is no flopping or sliding around as you ride. It offers plenty of storage, and the buckles keep everything packed together well. The Specialized Skitch shoes are nice for commuting and being able to walk. The toe is waterproof, and the sole is a sticky rubber so it grips pedals well. The cork insole offers some nice support as well. Lights are a huge part of riding, especially if you are commuting or adventuring in the dark. If you need more descriptions on our lights, see the Chris' Favorite Things section of this blog (above). Be seen and be safe! We hope you have enjoyed this Gift Guide, and found it helpful! If you have any other questions or would like to check out the items we featured, stop on by! We look forward to seeing you all in the shop, around town, and on bikes this season. 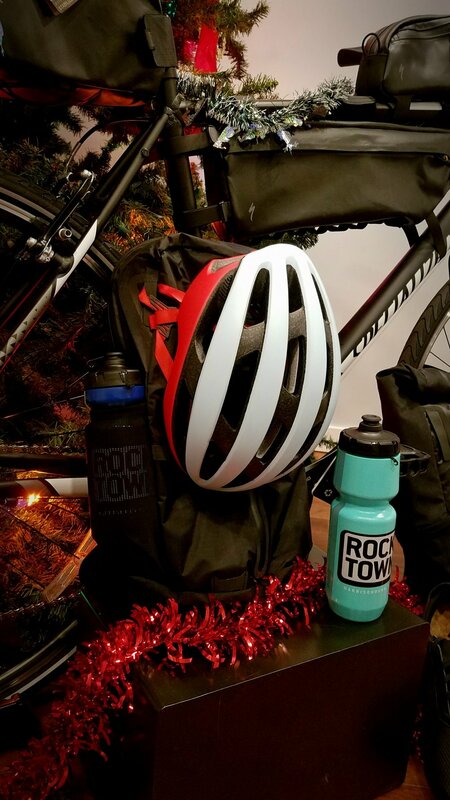 And don't forget, our Rocktown Holiday Party is December 8th, starting at 6pm, here at the shop. Come join us for a good time!